Provides both insight into the essential problems of Calculus (and the related field of mathematical analysis) and a rigorous proof of all of the standard material in a Calculus class. Ethan Duckworth wrote:I'm hoping that other people use these notes, add to them, make suggestions, spread them, etc. They are licensed under the GFDL (Gnu Free Documentation License), the same license that wikipedia and other groups use, so you can use the notes as you see fit, as long as they retain the GFDL. 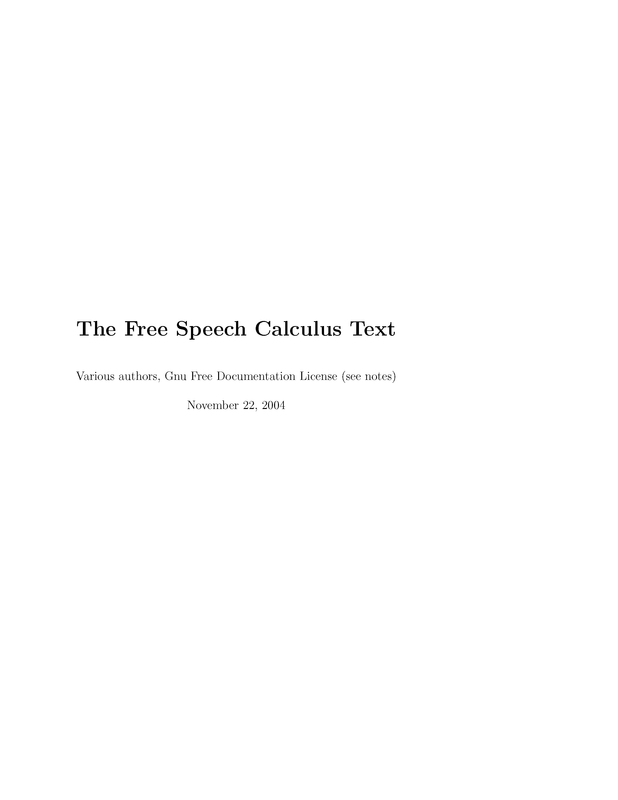 This text book aims to provide both insight into the essential problems of Calculus (and the related field of mathematical analysis) and a rigorous proof of all of the standard material in a Calculus class. However, we will not put rigor in the way of leisure or explanation. Thus, while we will prove everything, we will not always do so in the most sophisticated or efficient manner. One of the special features of this text is to include discussion of the historical controversies and so-called paradoxes which made Calculus such an exciting and hard-won mathematical field. This text will attempt to introduce the student to all of the varied roles which Calculus plays in science and academia. Calculus is an applied subject which forms the basis of elementary calculations in physics, biology, psychology, statistics, engineering, etc. Calculus is the first math class that most people have taken where they have to learn concepts that are not immediate generalizations of arithmetic or geometric intuition. Finally, and related to both of the above, Calculus is the first math class that many people take where statements are given that are not exercises in proof, like in geometry, but still need to be proven. Ethan Duckworth is an Associate Professor in the Department of Mathematics and Statistics - Loyola University Maryland. He received his Ph.D. from the University of Oregon.